How completely the signaling function of agrin at the NMJ will apply to CNS synaptogenesis remains to be determined. While CNS synapses have comparable pre- and postsynaptic specializations, CNS synapses are typically much smaller and may not require the degree of signal amplification that the MuSK cascade provides at the NMJ. 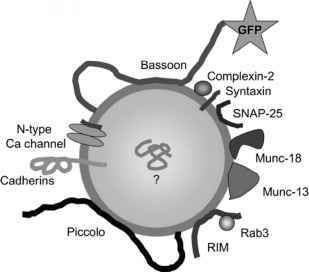 As subsequent chapters of this book will demonstrate, many CNS synaptogenesis mechanisms are based on adhesion molecules and direct contact of transmembrane proteins spanning the narrower synaptic cleft (Chapters 4-10), although the role of ECM molecules in formation and function of certain subtypes of central synapses is emerging (Chapter 11). Agrin clearly has effects on neurons36-38 (Chapter 11); however, whether agrin is functioning in CNS synaptogenesis is ambiguous. Several in vitro studies in which agrin is acutely perturbed suggest a role in synaptogenesis39,40, while other studies, including those in knockout mice and in primary cultures from those mice, suggest little effect41,42. The notion of agrin stabilizing synaptic connections against the disruptive effects of synaptic activity may also require a reassessment of the anticipated synaptic phenotype for agrin in the CNS. Recent work suggests that agrin may mediate a switch from gap junction connectivity to chemical synapses43, and cholinergic synapses in sympathetic ganglia are impaired but not abolished in agrin-knockout mice44. The presence of the CNS-specific transmembrane form of agrin is also provocative. However, additional experiments will be required to determine the extent to which this NMJ signaling molecule may also function in the brain.